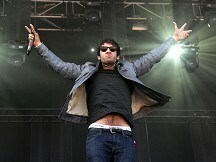 Rapper Example stormed straight to the top of the singles chart with his track Stay Awake. The song is the lead single from his new album Playing in the Shadows. Ed Sheeran, the 20-year old singer-songwriter, made it two singles in the top 20 with You Need Me I Don't Need You straight in at number four. His debut single The A Team slipped out of the top ten to number 13 this week. Last week's number one, Heart Skips A Beat by former X Factor contestant Olly Murs, featuring Rizzle Kicks, slipped down to number three. Maroon 5 and Christina Aguilera climbed one place to second with Moves Like Jagger, according to the Official UK Charts Company. In the albums chart, Red Hot Chili Peppers were straight in at number one with I'm With You. The Californian legends pipped David Guetta to the top spot. He came in at second with Nothing But The Beat. Adele continued to dominate the charts as her latest album, 21, took fourth place after 32 weeks. Her earlier album, 19, held on to seventh place. Amy Winehouse's Back To Black slipped to tenth place as three new releases entered the top ten. Bombay Bicycle Club's third effort, A Different Kind Of Fix, went in at number six while US rapper Lil Wayne was new in at number eight with Tha Carter 4. Country legend Dolly Parton rounded off the new entries in the top ten with Better Day, in at nine.